An environmental disaster is unfolding at Central Poultry Limited (Dudu Farm) in Area 36, Lilongwe due to poor waste management practices, Weekend Nation can reveal. The discharge from at least 10 000 chickens that are slaughtered and processed everyday, ready for the market, ends up in three small shallow dams dug just behind the farm’s brick perimeter fence. Communities say what is worrying is that Lilongwe River, which is a source of water for those living within its stretch, passes a stone’s throw away. The communities use the water for bathing, washing and in some instances drinking. Lilongwe Water Board (LWB) also draws water from the river and purifies it before supplying it to residents. But, in an interview yesterday, the company’s assistant maintenance manager Horace Kaluwa said five water treatment plants have since been purchased so that the farm can start treating the waste water. “The process will involve separating the blood and other discharge and add some lime and other ingredients and that the end product will be used for watering gardens around the premises. “It has also been our worry that during rainy season the waste is washed away, but now in the next four weeks we would have installed the treatment plants and dealt with the challenge,” he said. On our visits to the farm during the past two weeks, we found that the dams that were constructed without an exit are always full and the liquid waste overflows to nearby fields, lying on a steep stretching down to the river. The place also gives out a strong stench and faggots and flies are visible. During the rainy season all the waste is carried down to the river posing a danger to people using the water downstream. The dams also pose a danger to livestock and more seriously small children passing around the area as there is no fence to act as a barricade. 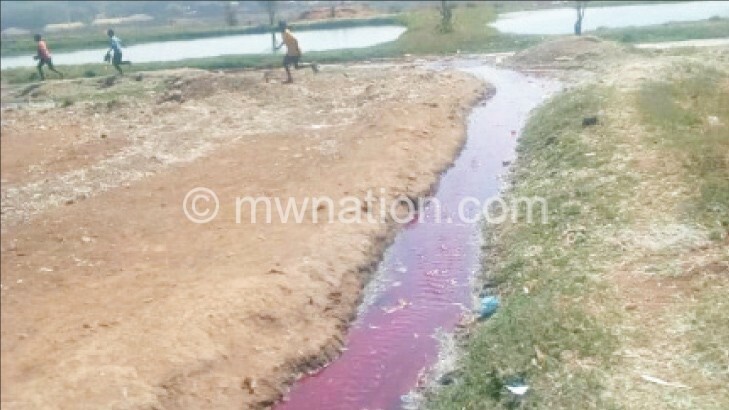 An environmental expert Wilfred Kadewa, from Lilongwe University of Agriculture and Natural Resources (Luanar) campus has since called upon authorities to intervene, saying public health protection is under threat if the waste that ends up in Lilongwe River does not meet required standards. With respect to waste management, the Environment Management Act spells out that before emptying anything that could come in contact with natural water, companies or industries should purify the liquid waste by removing all chemicals or anything that can disturb water quality. We have, however, established that Lilongwe City Council (LCC) and Department of Environmental Affairs—two government institutions mandated to look into such issues—are not aware of the existence of the dams. Department of Environmental Affairs spokesperson Sangwani Phiri said he did not know how waste is discharged at the farm. He hinted that a team of experts will visit the site soon to assess the likelihood of pollution and that necessary action will be taken. According to Phiri, most companies do not conduct environment audits, which endanger communities living near factories and other business areas. With regard to the farm, he said experts from his ministry should have carried out an assessment to ascertain if it was safe to have the dams there. Meanwhile, LCC is reviewing its by-laws, which among others, are expect it to address issues of compliance and punitive measures for companies violating waste management regulations. LCC director of health and social welfare services Vitto Mulula attributed the growing trends to, among others, low public participation and institutional challenges. He also indicated that officers will be sent to inspect the site by next week. LWB were yet to respond to our queries on the matter as we went to press yesterday. In November 2014, the Department of Environmental Affairs cracked its whip on Sun Seed Oil Company Limited in Lilongwe and its sister firm Central Poultry Farm for endangering communities. Both companies were ordered to halt operations and fined K1 million each following revelations by Weekend Nation that the cooking-oil company was discharging and emitting pollutants into the environment.